The launch of PlayStation 4 last week was good news for gaming community but lack of games for PS4 is a big turn off. Steadily and surely Sony is building up the games portfolio to match the hype and the sales that PlayStation 4 created. 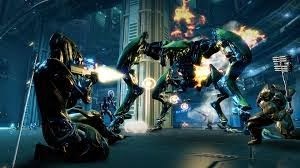 The latest game to be available for PS4 is a free sci-fi game called Warframe. And the added bonus is that this game is free to download. You can download the game from the PlayStation store directly from your console. Digital Extremes' Warframe debuted on PC last year and was a proven hit. The game is fun filled especially when you team up with your three other friends online to scale the missions together. The gameplay involves a militarized race called Grineer, whose armies are now spreading throughout our solar system. Your aim is to fight this Grineer thing with all your might. At the start of the game you've been pulled out your cryostasis chamber and trained alongside other warriors(your online chums) known as the Tenno. You then take advantage of an ancient exoskeletal technology called "Warframes" which essential gives you superpower to kill the Grineer. If you are interested in playing this free for all game, visit this link and download now.